As a primarily internet-based retailer, one question we are asked time and time again when speaking to customers is "Do you know where I can see *insert model name here* on display?". Actually, yes we do! The Rangecookers.co.uk showroom and headquarters is a purpose built range cooker display centre located in canalside Chester, in the north west nestled between Manchester and Liverpool. The showroom was completed in November 2007 and since then has developed and evolved into the primary showroom for range cookers and range cooking brands in the UK. Here in the showroom we have nearly forty range cookers on display from fourteen premium manufacturers ranging from familiar UK brands such as Belling, Stoves and Rangemaster, through to more esoteric French or Italian marques like Lacanche and Ilve (view our full display list here). We to try represent the whole spectrum of fuel types, sizes and formats offered by these manufacturers - from 70cm wide single cavities to vast 150cm wide models - as well as examples of the colours and finishes available. We try to provide examples of ranges that aren't readily displayed anywhere else, and this has served to attract customers from across the UK as well as visitors from more exotic climes. As a range cooker specialist we're naturally very experienced and well versed in all things range cooking so are able to spend time with you and discuss your requirements, what you might need and just as importantly what you might not need. As an impartial, independent retailer our team endeavours to help you find your perfect range cooker. 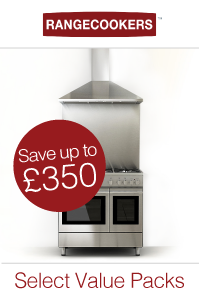 In addition to range cookers we also display a selection of cooker hoods, cookware and accessories. So … if you're looking for something in particular or are just starting your search our showroom is an essential destination. Chester is also a fantastic place to visit, and we have a number of notable bistros and restaurants within walking distance. There is plenty of parking nearby on-street, or alternatively we are only 5 minutes walk from Chester station.